If you’ve read much about education, you know that the Finnish educational system is the envy of the world. It sits on the top of the international PISA tests for academic achievement. The only countries higher than Finland are China and Singapore, but their schools are two part pressure-cookers one part gulag. Finnish children, in contrast, begin formal schooling at the age of 7, attend 300 hours less school per year than American children, and have the most recess and the lightest homework burden in the world. They have a lot of interesting characteristics like all teachers all must have masters degrees. There is also a new push in Finland to replace traditional subjects like history and math with expeditionary style learning projects called “phenomenon” teaching that integrate learnings. So instead of learning History and Economics, students will study the European Union for a semester. Or English class is replaced with a “Working at a Cafe” project where students simulate a cafe and work there all in English. It is “Not Possible” in the U.S. In any case, the verdict is in, Finnish schools are awesome, but don’t even think of proposing that the U.S. learn from the Finnish system. Your critics will scoff with how foolish you are for suggesting such a wild thought. Finland, these enlightened members of our society will tell you, is “only 5.3M people” and is more homogenous economically and racially. For some reason these folks think the size of a country determines how schools of a few hundred students work. These hard-nosed pragmatists also seem to not know that many of America’s private and public schools are often very, very homogenous. Why aren’t there just a string of private or charter schools that follow the Finnish model? Hire only teachers with masters degrees, increase the recess, lower the homework, replace subjects with topics, and all the other little funny details of those Nordic people’s schools. 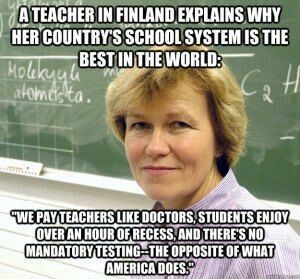 Maybe teachers can become a new export for Finland. If you think that there should be private Finnish-style schools in America, share this post with your community on Facebook and Twitter.